We are pleased and honored that Shona McCarthy and J.P. Singh will be joining us at this year's annual conference. Shona McCarthy is the head of the Edinburgh Festival Fringe Society, the organization that oversees the annual Edinburgh Festival Fringe, the largest multi-arts festival in the world (celebrating its 70th anniversary this year!). J.P. Singh is one of the world’s leading experts on cultural economics and policy and has recently been appointed as director of the University of Edinburgh's Centre for Cultural Relations. Shona McCarthy is the Chief Executive of the Edinburgh Festival Fringe Society - the charity that organises the structure which underpins the Edinburgh Festival Fringe, the largest arts festival in the world. Originally from County Down, Shona has dedicated her career to championing and developing the arts and culture. From 2011 to 2014 she was Chief Executive of the Culture Company, leading on Derry-Londonderry’s transformational year as UK City of Culture, creating and delivering a world-class, citywide cultural programme for 2013. Prior to that she was Director of the British Council Northern Ireland leading a team of 40 to oversee international programmes of work across schools, arts and Higher Education to build positive international cultural relations. She also spent many years as Chief Executive of Cinemagic Film Festival for young people; and the Foyle Film Festival; and was Head of Exhibition at the Northern Ireland Film Council. In 2007 she was the Northern Ireland recipient of a NESTA cultural leadership award which took her to live and work in India with Seagull Foundation for the Arts in Calcutta, and in 2014 she was Northern Ireland’s recipient of the Eisenhower Fellowship. As well as her Fringe commitments, Shona is also Chair of Oh Yeah Music Centre in Belfast, and Walk The Plank, a Salford-based theatre company specialising in outdoor arts and pyrotechnics. 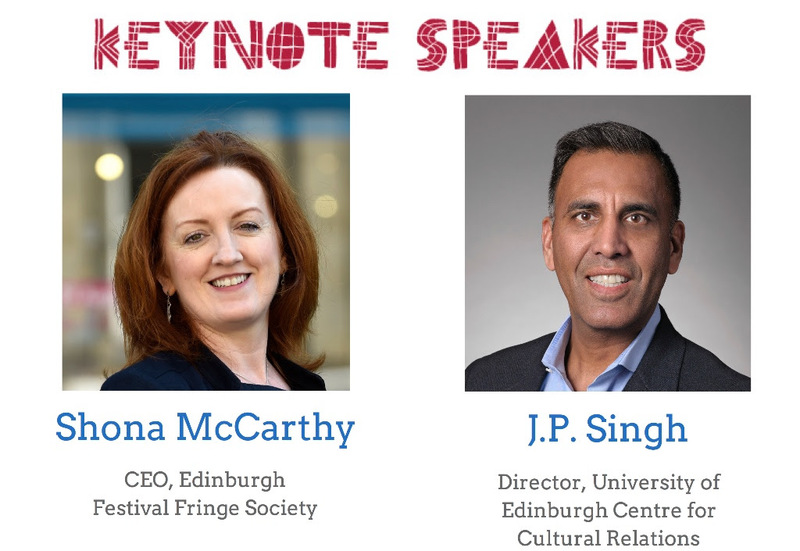 J.P. Singh is Chair and Professor of Culture and Political Economy, and Director of the Institute for International Cultural Relations at the University of Edinburgh. Singh has authored five single-authored books, three edited books, and published dozens of scholarly articles. His latest book is: Sweet Talk: Paternalism and Collective Action in North-South Trade Negotiations (Stanford, 2017). His book Globalized Arts: The Entertainment Economy and Cultural Identity (Columbia, 2011) won the American Political Science Association’s award for best book in information technology and politics in 2012. His current book projects is Development 2.0: How Technologies Can Foster Inclusivity in the Developing World (Oxford, forthcoming). He has advised international organizations such as UNESCO, the World Bank, and the World Trade Organization, played a leadership role in several professional organizations. He created and is Editor of the journal Arts and International Affairs. He also served as Editor from 2006-09 and dramatically increased the impact of Review of Policy Research, the journal specializing in the politics and policy of science and technology. He holds a Ph.D. in Political Economy and Public Policy from the University of Southern California.